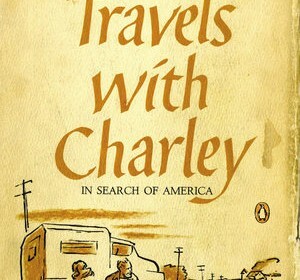 In 1960 John Steinbeck buys a custom made pickup truck and prepares his poodle Charley to go on an adventure. Traveling America from the tip of Maine to San Francisco, he rediscovers the country he has been writing about for years. Rocinante is his beloved truck and Charley is his cherished French poodle. Charley, his poodle, is a very social dog and can annoy Steinbeck at times. He is a very calm poodle who likes to play with other dogs. However when he gets the chance he acts particularly aggressive near bears. Rocinante is an undoubtedly reliable truck without an ounce of plastic and in Steinbeck’s words is “Built to last, unlike the modern SUVs that are built so cheaply that they need to be repaired every six months or so.” Finally there is Steinbeck himself, a smart man who is eager to smell the countrysides of America, see the sights, and meet true Americans again at the age of 56.